While visiting the United States this week, Guatemalan President Jimmy Morales sat down with The New York Times Español to talk about a series of topics, including immigration. 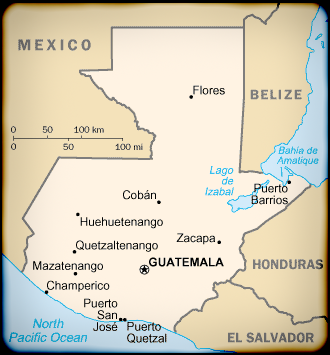 The interviewer shifts the conversation from Guatemala's tourism opportunities to immigration by asking the following: "President, in the United States' presidential election there's one candidate that proposes to build a wall to stop illegal immigration, and there are others that say that there needs to be a more serious proposal, more comprehensive, to address the region's problems. First, how do you respond to Donald Trump's wall proposal? Second, what advice would you give the next U.S. President if there is a desire to curb irregular immigration?" President Morales (a former TV comedian) jokingly responded, "Well, to the gentleman who wants to build a wall, I offer cheap labor. We have high quality labor and we'll gladly build. Tell us dimensions and we know how to do it." On a more serious note he continues, "To the one that poses a bigger solution, and I believe we will contribute to. We believe – although I have no reason to involve myself in U.S. migratory policy – we believe that it is necessary to think about migratory reform where many people who are there in an irregular manner will be regularized. And, that will also generate an economic benefit because those same people will contribute more and pay more taxes. Nevertheless that is an issue in the United States." Then, President Morales goes on to explain what Guatemala's role is within the subject of immigration, "How we can help, which is a common interest, is prevent migration. Guatemala is one of the countries that [sends] the most migrants towards the United States. And for us Guatemalans it is problematic that so much human talent is emigrating, because we are losing that human talent." He then says,"I think we can combat that common interest; we can work hand in hand generating job opportunities in Guatemala. How job opportunities? Generating businesses, generating employment, generating economic links, taking better advantage of our trade agreement in such a way that the United States itself could give us some preferential treatment for our goods and that way we could convince our people there to engage in certain economic activities and they have a safe future here. But I believe that if we sit down to find a solution, it is going to be much easier because two is better than one to solve a problem." While President Morale's recommendations for "comprehensive reform" and a "path to legalization" are not surprising, his prescription for reducing illegal immigration is of particular interest. The Guatemalan president elaborated on the lack of economic opportunities, Guatemala's loss of human capital, and the importance of job creation. But the subject of violence was noticeably absent from his discussion. This raises the question: why does the narrative in the United States continue to frame the immigration issue around violence, continually dismissing the economic factors in play?